Last night my wife and I could see a bright planet shining above the trees, which is unusual for being in Boston. We didn’t know what it was, but I knew how to find out after just having read about Stellarium. 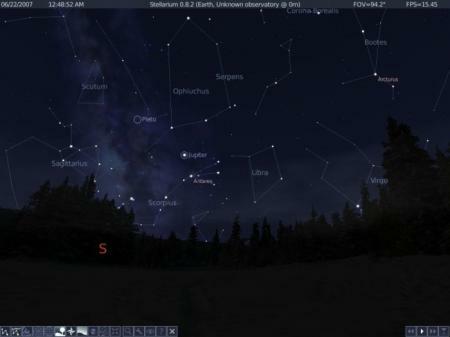 Stellarium is a free, open-source computer application that runs on every common kind of operating system. Even on my Ubuntu Linux computer it pans smoothly across the sky, and lets you zoom in on particular astronomical bodies (600,000 stars by default, according to the website). I can’t wait to take this on a laptop into the wilderness, where it can help us learn the constellations and identify stars. Because you can dial up any particular time, serious star-gazers can plan a future night’s viewings or see astronomical events from the past. The first picture is what you would have seen from our apartment window last night, if Boston weren’t in the way. 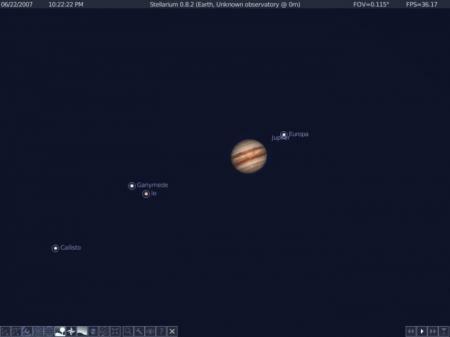 The second shows Jupiter an hour ago, as it drags its moons across the sky. This entry was written by filosofo, posted on June 22, 2007 at 11:54 pm, filed under Science, Space. Bookmark the permalink. Follow any comments here with the RSS feed for this post. Post a comment or leave a trackback: Trackback URL. With a six year old in the house who gets excited just looking at the moon this app is awesome. Plus its open source! Even better for me. Thanks for the info. As an avid stargazer I thank you for alerting me to this great application. It’s surprising what you find without really looking.